Cleveland — The 2017 Sherwin-Williams Impact Award recognizing outstanding water and wastewater projects goes to an infrastructure rehabilitation contractor with a big heart and a rural community in desperate need of infrastructure repairs. 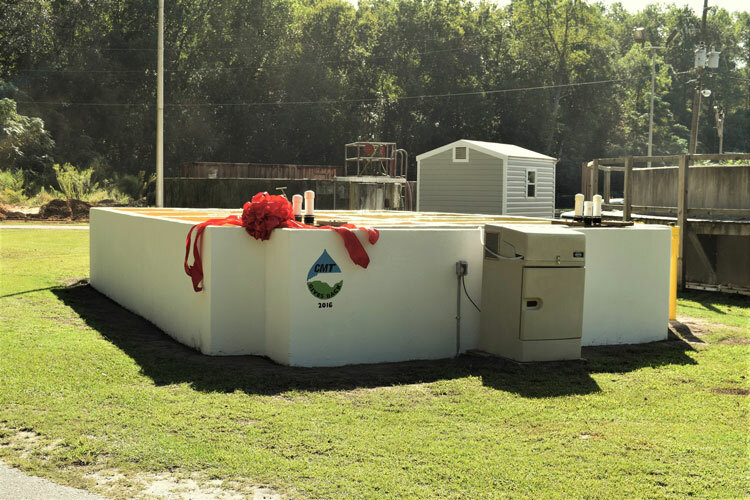 For the winning project, Carolina Management Team (CMT) rehabilitated the chlorine contact chamber at the St. Pauls, N.C., wastewater treatment plant at no cost – a donation topping $46,000 in estimated value. This benevolent project secured this year’s Sherwin-Williams Impact Award, which recognizes notable projects featuring coating and lining materials from Sherwin-Williams Protective & Marine Coatings. The company announced the winners at the Water Environment Federation’s Annual WEFTEC Conference on October 3, 2017, in Chicago. St. Pauls’ more than 50-year-old chlorine contact chamber was severely deteriorated due to the highly corrosive process of chlorine wastewater disinfection. To complete the rehabilitation, CMT’s crew rebuilt the surface profile of deteriorated concrete within the chamber and then applied Sherwin-Williams FasTop MVT Moisture Control System to address moisture penetrating the chamber’s floor. Finally, the crew applied a primer coat of Dura-Plate 235 Multi-Purpose Epoxy followed by one coat of SherFlex Elastomeric Polyurethane to the walls and floor of the structure. Additionally, the crew used Macropoxy 646 Fast-Cure Epoxy and Acrolon 218 HS Acrylic Polyurethane to restore valve stands and influent piping, as well as Sher-Crete Flexible Concrete Waterproofer to protect the exterior of the contact chamber. “The tremendous benevolence that Carolina Management Team offers each year to local municipalities via its CMT Gives Back program is a testament to the care and compassion that water and wastewater professionals have for their communities. Water is the elixir of life, and without concerted efforts like CMT’s to restore infrastructure for those in need, more and more communities would be facing the worries of losing access to this vital asset,” said Morris. Among the numerous award entries, two water tank restoration projects stood out as runners-up for the 2017 Sherwin-Williams Impact Award. First, UCL Inc. (Cincinnati, Ohio) and Dixon Engineering, Inc. (Lake Odessa, Michigan) teamed up to recoat a multi-leg elevated water tower for the City of Findlay, Ohio. The 2 million-gallon tower’s new patriotic design features a red, white, and blue design resembling an American flag, complete with stars and lettering stating, “Findlay Salutes Veterans.” For the project, UCL applied a primer coat of Macropoxy 646 PW, followed by two coats of Acrolon Ultra for the white coloring and Fluorokem HS for the red and blue coloring. The other runner-up project was a 4.5 million-gallon potable/fire water storage tank restoration performed for the Mukilteo Water and Wastewater District in Mukilteo, Washington. HCI Industrial & Marine Coatings Inc. (Brush Prairie, Washington) restored the tower under challenging conditions, including a short, mandatory project window and close proximity to parking areas. HCI relined the interior of the 80-foot diameter by 120-foot tall tank in 47 days, from draining to refilling, using Sherwin-Williams SherPlate PW Epoxy, an edge-retentive, ultra-high solids coating engineered for immersion service. To recoat the tank’s exterior, the company applied Acrolon Ultra HS. Gray & Osborne Inc. (Seattle, Washington) served as the consulting engineering firm for the project. In addition to its award-winning project, CMT also secured honorable mention status for a difficult pipe recoating project for the Kerr Lake Regional Water System located in the City of Henderson, North Carolina. The filter pipe gallery at the Kerr Lake Regional Water Treatment Plant was deteriorating, showing flaking paint and visible corrosion. To recoat the filter pipe gallery assets, CMT used Euronavy ES301 and Corothane I HS from Sherwin-Williams. The two moisture-tolerant systems were required because the pipes were condensing during the project due to the need to keep the gallery in operation during the restoration.